Today’s world is fast-paced. We fuel ourselves with microwave meals at home and fast food on the go. We want high-speed internet, next-day delivery and eyeglasses in an hour. We expect fast weight loss from fad diets and immediate results from the latest training regimen. 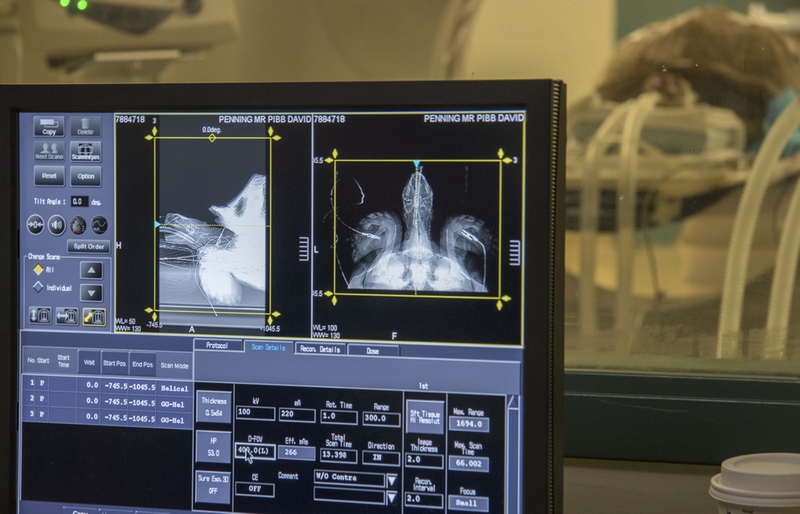 Mr. Pibb, a 60-pound sulcata tortoise, was referred the Veterinary Health Center for treatment of a large hole between the oral and nasal cavities. Yet, Aesop’s fable reminds us that the slow and steady tortoise wins the race. Sometimes, by a nose. Mr. Pibb, a 60-pound sulcata tortoise, had a nose that was not a winner. It was a problem. “Dr. 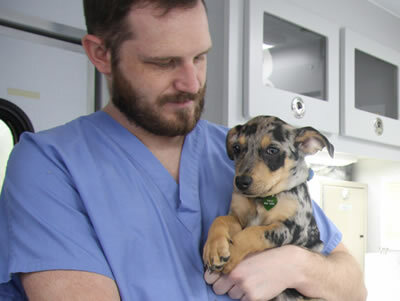 Penning, Mr. Pibb’s owner, is an assistant professor in the Department of Biology and Environmental Health at Missouri Southern State University in Joplin,” adds Jennifer Blakely, a veterinary student who assisted with Mr. Pibb’s treatment. An oronasal fistula is a hole between the oral and nasal cavities. “This is something that we commonly see in dogs, and it can be challenging to close these areas, Brophy says. “Our poster children for this condition are older dachshunds, dogs that have long, skinny snouts and large canine teeth. They can get infection and periodontal disease in those canine teeth and it starts to erode away the bone between the oral and nasal cavity. If you have an older dachshund on the table, and it has a canine that looks bad, you can flip a coin on whether it’s going into the nasal cavity. That’s how common it can be with dachshunds. “We didn’t see the patient until the morning of the procedure. The owner sent us some pictures that were intra-operational, showing the referring DVM flushing out the area, which helped to show us the extent of the wound, or fistula, and its outward appearance, because it was malformed. Brophy says her theory is that fibrous material somehow punctured the palate of the tortoise and created an infection that festered. “They don’t have teeth on top; it’s just a beak and all this fibrous tissue. That’s what made it super challenging. To understand the extent of Mr. Pibb’s condition, Brophy ordered a computed tomography scan. A CT scan showed the extent of the damage to Mr. Pibb’s oral and nasal cavities, but showed no indication of cancer. “We used a punch biopsy tool and removed a circle of necrotic tissue leaving an opening on the top of his nose into his sinus cavity,” Blakely explains. “It was in that nasal cavity and all the way back down into the throat,” Brophy says. “We had to flush it really well multiple times, alternating with suction to get that out of there, because it was pocketing. That was showing up on CT.
“It wasn’t in the initial plan to close that huge void on that day,” Brophy says. “We were trying to really limit our anesthetic time, assess and rule out neoplasia, take a culture and maybe send the patient home with some antibiotics. Maybe we could get the tissue a little bit healthier, and then have him come back and we would try to close it. How do you fix a 1.5-by-3-inch gap inside the head of a tortoise? Do some horsing around with it. Brophy consulted with Joanne Kramer, an associate teaching professor of equine surgery at the VHC. “She suggested using a two-part material they mix up and put in special boots to treat horses with laminitis. When you mix it, it changes from a putty to something the consistency of a Super Ball: really rubbery and bouncy. “I had never worked with it before, so that morning I was experimenting to get the consistency I wanted, in the time I wanted,” Brophy says. “I thought I had it straight. I didn’t. Richard Meadows, DVM, DABVP, Curators Teaching Professor, Meagan Brophy, DVM, clinical instructor, and then-third-year veterinary student Jenny Blakely, work to clean out and repair the gap in Mr. Pibb’s nose. “To plug that hole, I had access from the top and from the mouth,” Brophy continues. “I was trying to make it a C-shape, where it would attach to the bone around the hole and the palate, to give it the strength of something like a ledge. He could still chew on it but it would be so dense that nothing he would eat would penetrate it. I wanted to create a false palate, where we would still have access to the nasal cavity to form this hole. “I thought I had perfected the consistency, so I made it pretty, but it never cured,” Brophy says. “I checked on the patient in anesthetic recovery, but the material still had not cured. This tortoise was probably about to wake up. I pulled that first attempt out — the one I had probably spent 30 minutes trying to make pretty — mixed another batch and shoved it into the void space in about five minutes. This patient wasn’t even on anesthetic gas; it was in recovery, mildly sedated. We put a passive catheter through the nasal passage, to make sure we didn’t block it off too much, so he could still breathe through his nose. 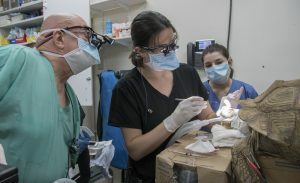 “We made sure all of that was good, and then we sent the owner home with some injectable antibiotics and some sterile saline with instructions to flush through the hole on the top of the nasal cavity once a day,” Brophy says. “We needed to keep that area open and make sure we were not making a perfect environment for anaerobic bacteria. Turtles, tortoises and terrapins — the Testudinidae family of the Testudines order — are one of the oldest reptile groups in the world, dating back to the time of the dinosaurs, about 220 million years ago. Testudines are not just ancient, they are the longest living land animal in the modern world. In general, most tortoise species can live 80–150 years. To clarify, tortoises are land dwellers with round, stumpy feet. Turtles spend most of their time in water; they have webbed feet for swimming and flatter backs. Terrapins spend time both on land and in water. Family members survive in almost every type of climate and are found on every continent except Antarctica. Of the approximately 300 species, 129 are vulnerable, endangered or critically endangered. Testudines cannot “come out of their shell.” A tortoise’s shell is part of its skeleton, not just an exterior shield. Made up of more than 50 bones, including its rib cage and spine, the shell grows with the animal. Sulcata tortoises, like Mr. Pibb, are the largest mainland tortoise. Sulcatas easily reach 30 inches in length and well over 100 pounds in heft. Some males even reach 200 pounds, but those examples would be in the upper age range. 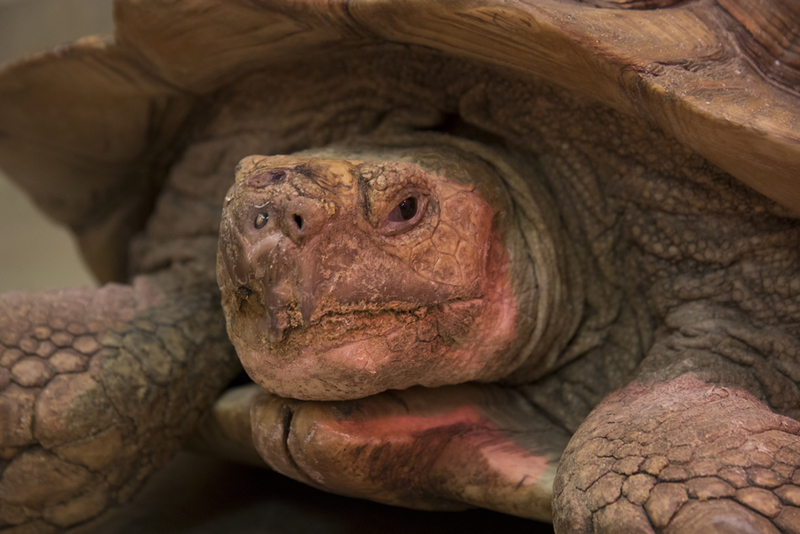 Sulcatas are also known as African spurred, African spur thigh or simply spurred tortoise. Originating in north central Africa, sulcatas have shown an amazing ability to adapt to various climates and habitats in captivity. Sulcata tortoises are bred on a large scale in the United States, generally in the Southern states from coast to coast, where it is easier to keep them outdoors year-round. Their low cost, lively personalities and curious intelligence make them popular with first-time tortoise owners. The origin of turtles has been one of the last unanswered questions in vertebrate evolution. Traditionally, paleontological and morphological studies placed Testudinidae as evolving either from the ancestor of all reptiles, or as evolving from the ancestor of snakes, lizards, and tuataras. Recent genetic studies indicate that Testudinidae are related more closely to dinosaurs, crocodilians and birds than to snakes and lizards.